Bangkok Day 2 – No more tuk-tuk for me! I’ve heard so many good things about Bangkok from Shum, DF and a few other people, and all claimed that Bangkok has cheap (and good) food and friendly people. With great expectations and anticipation, we set off the next morning to visit the Grand Palace; something rif wanted to do, not me. There were a few things I hated about Bangkok. For the taxis, the meters in them don’t mean a thing. Most taxi drivers charge as they like, so before you hop in to one, ASK if they use a meter. As for the tuk-tuk — take it from me, and NEVER ride on one. No matter how interesting they may look, and how “cheap” they can cost. Often, the tuk-tuk driver will tell you it only costs 40 baht for a ride, and he will take you everywhere BUT the destination you want to go. All for their gasoline rebate. We got taken for a ride, and since I didn’t want to be a b***h, I didn’t tell him off. The crook (pic above) left us stranded at The Marble Temple, and we had no choice but to take another tuk-tuk, who promised to take us to Platinum Mall. He didn’t. rif told him off when he asked for 400 baht just to get to the mall. Long story short, we hailed for a cab (who used a meter) and got to the mall in 15 minutes — for about 100 baht. Based on Shum’s recommendation, we had lunch at the food court located at the top floor of the mall. I wanted to try the pad Thai, which consisted of rice noodles stir-fried with egg, chicken/pork/seafood, fish sauce, chilli powder and tamarind juice. 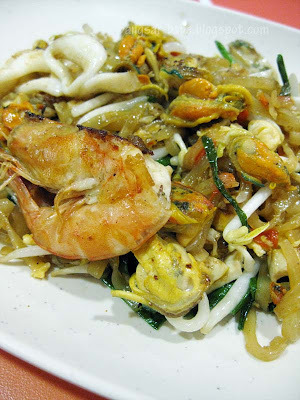 It comes garnished with crushed peanuts and coriander, and you can add more chilli powder or fish sauce for more oomph. The condiments are sugar, chilli powder, vinegar with chilli and fish sauce. 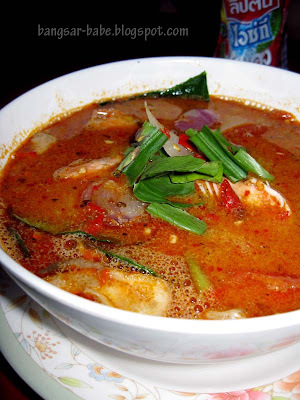 The chilli in Bangkok is a lot spicier than the ones we have in Malaysia, so use it sparingly. Unless you want to feel the burning sensation in your mouth, throat, esophagus, tummy and bowel. The seafood pad Thai (70 baht) from the Platinum Mall food court was not bad by my standards. Note that I’ve never eaten pad Thai from Thailand before, so my opinions might vary. I added more chilli flakes and fish sauce at the condiments section for an extra kick. Adding sugar to my noodles was something new to me, but I used it sparingly as the food was already on the sweet side. Remember to taste the food before flavouring it! 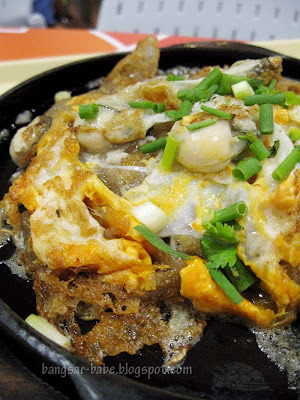 The Hoi Todd / oyster omelette (90 baht) from the same stall looked enticing, so I ordered a portion to try. Brimming with plump, juicy oysters, the omelette had crispy edges and a soft, moist centre. Unlike the Malaysian version which is salty and lardy, this one was slightly sweet and pungent from the liberal use of fish sauce. This tasted even better with the addition of chilli powder, vinegar chilli and fish sauce. rif went with his instincts as well, and came back with what I thought was a Thai version of wat tan hor, minus the egg laced gravy. The pork gravy noodles (35 baht) were quite good, and the condiments really helped punch up the dish. 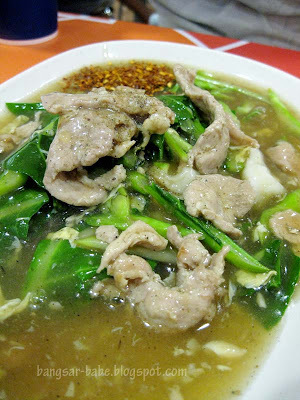 The gravy tasted light and peppery, which went well with the broad rice sheet noodles and tender pork and squid slices. Shopping in Platinum Mall was crazy — almost everything was 50-70% cheaper than the things sold in KL. But you’ll have to buy things in bulk for better discounts. Even without the discounts, the clothes were still cheaper the ones sold in KL. I’m not the kind of girl who goes out shopping, I like doing my purchases online — so walking around this mall was a challenge. By 5pm, I was tired, and peckish, so we went back to the food court to grab a bite. 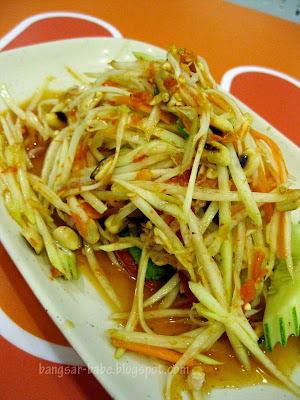 The som tam — 35 baht (Thai papaya salad) was alright, at least for me. The lady pounds the essential som tam ingredients in a large mortar, producing a vibrant, zesty salad in less than 5 minutes. It was spicy, crunchy and light, rich in flavours and textures. Being greedy, we also shared an order of rice with pork and Thai stir-fried noodles. 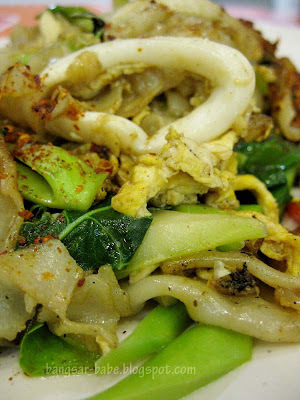 The noodles had slightly charred bits and were full of wok hei goodness. This was a simple (almost peasant-like) dish that was well flavoured and a delight to eat. The pork rice on the other hand was disappointing. 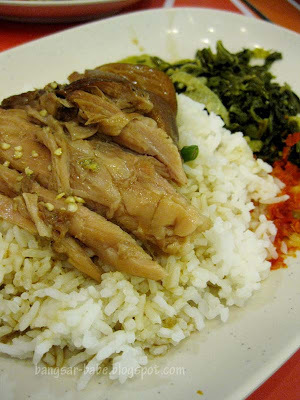 I found it bland, uninteresting and visually unappealing -– it was merely white rice with some pork meat plonked on top. rif however, thought it was alright. For dinner, we shared a plate of pad Thai from a vendor nearby our hostel along Sukhumvit 11. For 50 baht a plate, I thought this seafood pad Thai was better than the one we ate at the food court. The gently chewy, translucent rice noodles were mixed with a handful of beansprouts, scallions, tiny clumps of scrambled egg and a final touch of basil and crushed peanuts. 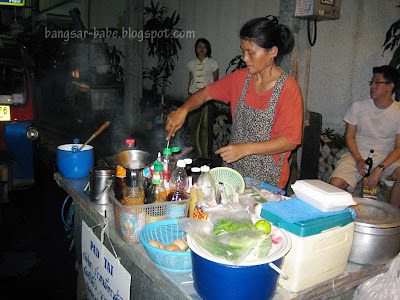 Further down the road was a makeshift stall selling Thai dishes such as basil pork, stuffed omelette, tom yam kung and other stir-fried dishes. 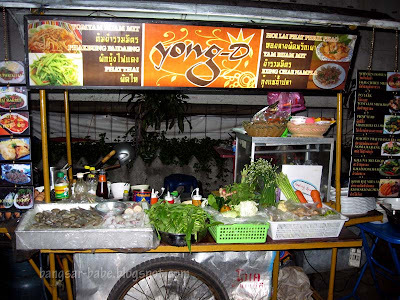 This stall didn’t have an English menu, so using some hand-signals, I ordered the tom yam kung (90 baht) to try. 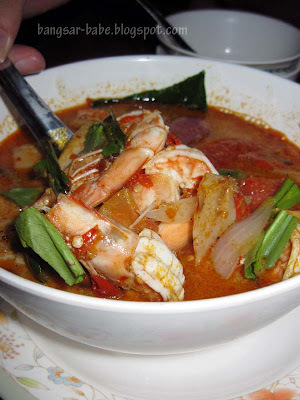 Spicy and aromatically shrimp-y, the tom yam broth was full of typical Thai flavourings – tangy, spicy, pungent, sweet and peppery. The broth was fragrant from the lemongrass stalks and basil, and had a generous assortment of shrimp, mushrooms and onions. It was not as fiery as I expected it to be, but spicy enough to make my lip tingle and send beads of sweat down my neck. Good stuff! Bangkok Day 3 will be up soon…so stay tuned! 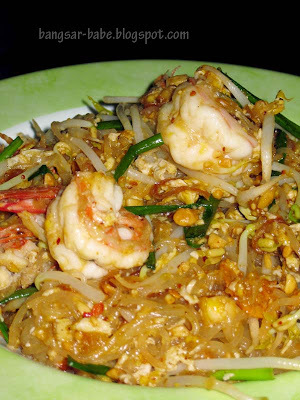 i went for the pad thai at platinum mall too..instincts does work quite well hor..
Bangkok can be frustrating to start with – the tuk-tuk drivers takes you for rides to places you don't want to go…so I have given up on the tuk-tuk drivers and I just use the meter taxis…or skytrain/subway. 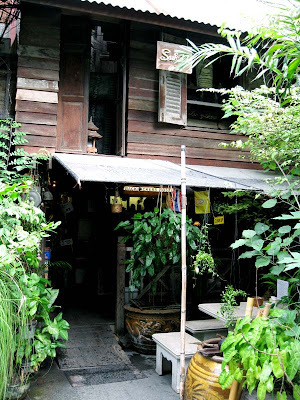 I have been to Bangkok a number of times now as I normally stop there when I have gone on business to Kuala Lumpur. You should also be warned that when you go to places like Grand Palace there will be people telling you that it is closed etc but it is of course just lies so don't fall for it 😉 Have fun int Bangkok. surprisingly, we had no problems at all, with the taxi service in Bangkok. most (if not all) used meters without us asking. but never hop on tuk tuk, UNLESS its a very short distance, and the price is justified. 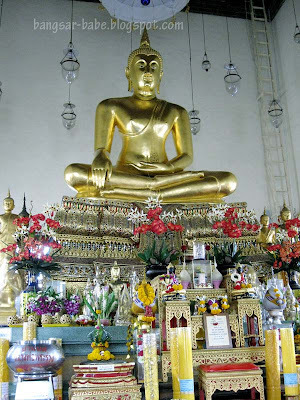 the only place that worth taking tut tut is Chiang Mai… hahahaha! speaking from someone who only have been to Bangkok and Chiang Mai!!! they will send everywhere you wanna go… but they will promote heavily on some local industries but oblige if you don't feel like going! As for Bangkok.. I stumbled upon Platinum Mall by chance in 2006! I didn't even do any research back then! Yeah… the air-conditioned mall is better to shop compared to Chatuchak market! Ugh I hate them dishonest tuk-tuks! Once in a blue moon, we run into a tuk-tuk who actually charges an honest fare and doesn't take us on the scenic route, but those encounters are becoming more with each visit. BKK mall food courts are the bomb… put KL ones to shame! You mean you didn't try the motorcycle taxis? *ROFL* Taxi's are the same back home as well 😉 Chalk this one down as experience lor. I am dreaming of BKK now! lol! we had the same experience in Bangkok….most of the tuk tuk driver will take us for a ride, in order to get their petrol voucher…i think thats common! KY – LOL…lesson learnt, definitely! BBO – Hahaha…BKK without the tuk tuk. 550ml – Yes…I love love love the food malls! Gard – They told us the grand palace WAS close…which was why we got into the blardy tuk tuk…gah!!!! Joe – Hahaha…yup, most of the time!